The nationally-ranked cuisine from Al’s Burger Shack is taking on a new form: a pub-style comfort food haven, complete with plenty of restaurant sitting space. 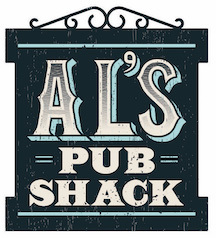 For those familiar with the standing-room-only and outdoor patio atmosphere of Al’s Burger Shack, the Pub Shack is a significant shift. The menu is all-new and all-different too, boasting everything from classic fish and chips to full-on deli decadence in the form of the “Huff Daddy” sandwich – a pile of smoked pastrami, muenster cheese, caramelized onions, broccoli slaw and spicy sweet mustard on a baguette. At tables surrounded by pictures of the Bowers family and their friends, as well as some other familiar local faces, the open kitchen concept will not only be serving up its expansive new Al’s menu, but also a large wine and beer selection that favors North Carolina products. The Pub Shack is located at 50050 Governor’s Village in Chapel Hill and will be open Monday through Thursday from 11am-10pm, Friday and Saturday from 11am-12pm, Sunday brunch from 10am – 2pm and the full menu until 10pm.